I’ve always found quarries disturbing places – the wholesale delving into the earth, the ravaged landscapes left behind. And yes, I know we need the resources. (Our own house is built of this fossilized Silurian Sea, although actually I’d be just as happy with brick or timber). Shadwell Quarry behind Much Wenlock’s Windmill Hill is only one of the many old limestone quarries along Wenlock Edge. These days they are no longer worked but host various business enterprises that simply need a large amount of storage space. Quarry owners are supposed to do some restoration after the blasting has stopped, but I’ve not noticed much of this actually happening. These photos show how slowly recolonization of quarried land takes place. (For an aerial view go HERE.) It has been twenty years since Shadwell was decommissioned. 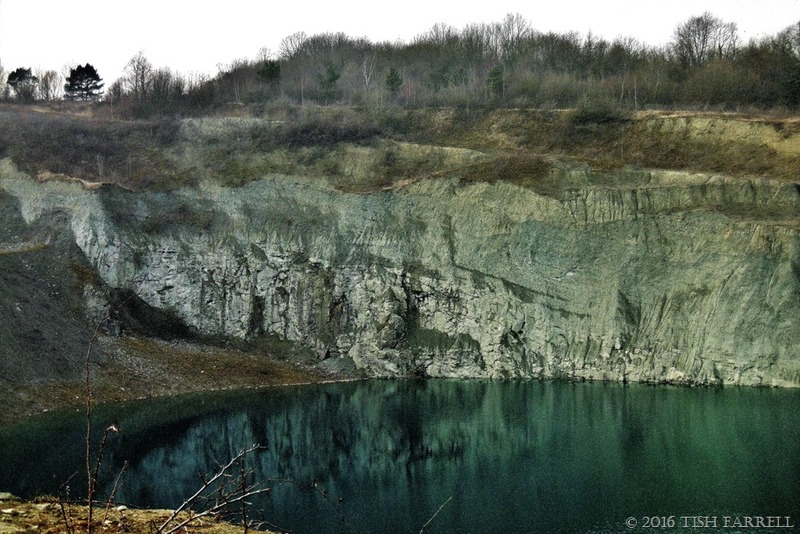 The water in the quarry bottom is also a strange blue, almost turquoise at times, coloured by the limestone deposits. At over seventy feet deep, it lures tipsy young men to prove their manliness by diving in from one of the man-made cliffs while their mates film the act and post the videos on You Tube. Last summer I spotted gangs of school leavers heading off behind Windmill Hill. They were armed with ghetto blasters and towels and I overheard them saying they were ‘going to the beach’. It’s interesting how people’s perceptions of places differ. One sees ‘exciting resort’; another oppressive dereliction – albeit with strains of desolate grandeur. This week at Lost in Translation Paula’s theme is ‘forbidding’. Please call in there if you want to take part in the challenge. She suggests many possibilities for interpretation. 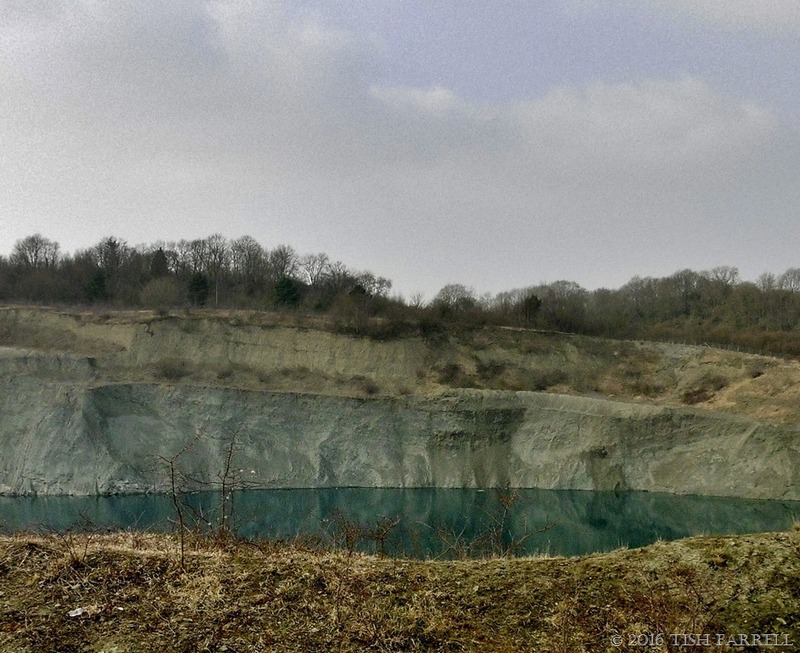 Posted on March 31, 2016 by Tish Farrell	This entry was posted in Environment, geology and tagged limestone, Much Wenlock, photo challenge, Shadwell Quarry, Silurian Sea, Thursday's Special, Wenlock Edge. Bookmark the permalink. Tish, I know they are forbidding, but please, don’t hate me for feeling so attracted to the turquoise water in the quarry. The photo with the fence is the most convincing one when it comes to forbidding. Honestly, I would know your photos among thousand different photos of similar scenes. I’m very happy and honoured with your submission. Big thanks. Those waters look so appealing in your captures ,in spite of the abandoned area you describe ….! 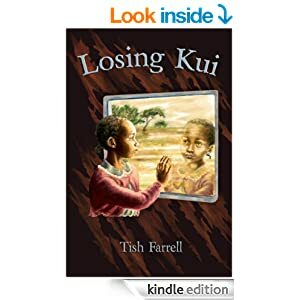 The entire post is a great one , Tish , thank you! Every years, a few dozen kids drown in those quarries. Some because of rampant stupidity, others because they fell and couldn’t get out. We’ve got them all over New England. Our Shadwell Quarry did have permission to become a diving school, which would at least have provided order and organisation, but nothing came of it. The mention of all your New England quarries makes me think. When we’re busy admiring fine 19th century civic buildings etc we forget the gaping holes in the ground they left behind. That’s intriguing name-wise. Local history here says it’s a contraction of ‘shady well’. But I’m wondering if there’s a connection re quarry ownership – someone connected with Shadwell here, maybe went out to Oz? The quarry is in a small country town some distance from here. Next time I’m up that way I will see if I can learn more. Beautiful images – love them… We have lots of quarries around here also, the whole area is sitting on one giant gravel bed and gravel of course is the main ingredient in aggregates and the needs for cement, especially now that hillside development is “de rigueur” due to a lame and late effort to protect remaining flat agricultural lands, is of paramount importance. Unlike yours however, our quarries are just deep holes, gravel extraction pits now filled with water. For good swimmers, they make awesome pools since the water tends to get warm enough to swim in, much sooner than in our rivers or lakes. I’m almost sure we have planning conditions that say just that, but it depends on local authorities enforcing the conditions, and that doesn’t seem to happen in Shropshire. We were hoping that many of the quarries would be acquired by the National Trust. They had wonderful plans for restoring and re-using the spaces for all manner of leisure pursuits – both quiet and active. The Edge is a site of international scientific interest for its geology. But it did not happen. I share your feelings about quarries, Italian marble being carved from the earth and transported around the world to rich peoples homes – and Dartmoor granite! Similarly to you, I often think “the earth is wounded” when I see a quarry. However, your pictures convey a strong sense of rough beauty I quite like. 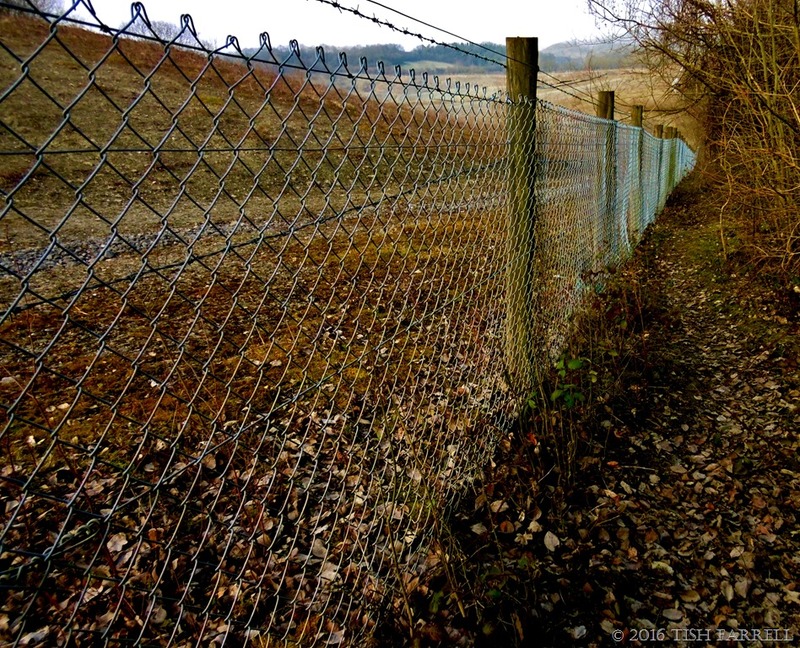 And though I do not particularly like fences, I love that picture too, especially as a response to Paula’s challenge. Thank you for all those nice comments, tms. You have captured the theme with both your images and words of explanation, but I do love the rich green shade of the water. These are amazing photos and the link puts them in context – what a view! The colours make them look like quite sinister places, although I agree there is something beautiful too. Sinister beauty? I’ll go for sinister beauty – after all it’s the stuff of fairy tales. Those rocks around your house have quite a history. Man’s (we’ll let you women off the hook for a while) plunder of the earth leaves scars, not to mention all the piles of concrete and styrofoam cups, and not to mention nuclear waste material by the tonload, but it all grows back eventually, and meanwhile some good swimming holes. And photos. Cheers, Stephen. It’s good to celebrate the good sides of things, even if we all glow in the dark after a dip in nuclear seepage. Most of the UK’s goes into the Celtic Sea I believe – off North Wales. I recently read there are 120 nuclear disposal sites in united states. I thought that was what they had Nevada for. Oh dear. And now we have dental amalgam to worry about too.